Everyone in healthcare says, “We only want what’s best for the patient.” No one wants to contribute unnecessarily to burgeoning national healthcare costs. Yet physicians on either side of the heated imaging self-referral debate look at the same evidence and draw very different conclusions—and their respective conclusions seem to correlate with their specialties’ business interests. In many respects, the present debate isn’t new; it’s just the latest chapter in a long-running argument about human nature and physician financial incentives. Since the early days of the so-called Stark legislation, the federal government has focused considerable attention on physicians broadening their revenue sources by providing ancillary medical services for their patients. The product of a 20-year battle on Capitol Hill, the bewildering set of Stark regulations now in effect are based on provisions in the Omnibus Budget Reconciliation Acts of 1989 and 1993 and the Balanced Budget Act of 1995—known respectively as Stark I, II, and III. • Antikickback statutes (Medicare and Medicaid Patient and Program Protection Act of 1987 and similar state laws) prohibit healthcare providers from paying for or being paid for referrals. Prohibited “payments” for referrals include any cash or in-kind compensation. • Preauthorization requirements established by most payment systems force physicians’ treatment plans to be reviewed by the payers before they will authorize reimbursement. Surgeries, big-ticket diagnostics, and courses of treatment or care, such as physical therapy, durable medical equipment, and home health services, routinely require preapproval. • Global surgery packages and bundled fees make it nearly impossible to “pad” the reimbursement for certain procedures with additional services. Payers develop a list of “standard” services included with the primary procedure and a “global period” during which related services aren’t eligible for additional reimbursement. • Alternate payment systems, such as capitation and diagnosis-based reimbursement, are designed to counter fee-for-service incentives that reward providers for adding procedures and extending treatments. The battles over self-referral have spread from payers vs. providers (including the government as a payer) to providers vs. providers, as specialists and hospitals become involved in turf wars over who should provide certain medical services. The ACR has taken a clear stand against nonradiologists providing their own imaging services. In 2006, when the Maryland Board of Physicians interpreted the state’s 1993 anti–self-referral legislation as prohibiting physicians’ referring patients from their own MRI or CT services, a coalition of orthopedists and urologists sued—unsuccessfully. The Maryland Court of Appeals upheld the lower court’s decision this past January—to the applause of the ACR. This past April, the ACR threw its support behind Rep Jackie Speier (D-Calif.) as she reintroduced the Integrity in Medicare Advanced Diagnostic Imaging Act of 2011 (HR 1476), which seeks to close the in-office ancillary service exception for advanced imaging services such as MRI, CT, and PET and “plans to work with Congress to gather more cosponsors,” according to an April 15 article on AuntMinnie.com (“Self-Referral Bill Resurfaces in Congress,” April 15, www.auntminnie.com/index.asp?Sec=nws&Sub=thd&pag=dis&ItemId=94968). 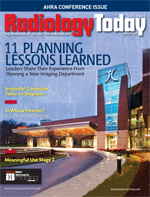 Individual radiologists have become increasingly vocal too. David C. Levin, MD, former chairman of radiology at Philadelphia’s Thomas Jefferson University, along with colleague Vijay M. Rao, MD, drew national attention with the publication of their data analysis in the Journal of the American College of Radiology (JACR) in March 2004. “Turf Wars in Radiology: The Overutilization of Imaging Resulting From Self-Referral” looked at data from the Medicare Payment Advisory Commission and the Government Accountability Office (GAO) and concluded that imaging self-referral costs the American healthcare system $16 billion per year in unnecessary imaging. This conclusion rests on Levin’s and Rao’s assumption “that the number of referrals to radiologists delineate the necessary and appropriate utilization rate of imaging and that the additional studies accruing to self-referral are largely unnecessary.” The study’s authors carefully pointed to evidence in two studies that indicated on-site imaging referrals rise significantly even without financial incentives. The mere proximity and convenience apparently drive up utilization rates. Much of Levin’s and Rao’s work relied on studies conducted 20 to 30 years ago, but they provided an update in the JACR in July 2008 (“Turf Wars in Radiology: Updated Evidence on the Relationship Between Self-Referral and the Overutilization of Imaging”) using Medicare data through 2004. Further, Levin said he had recently updated his work to include Medicare data through 2009. The as-yet-unpublished update tracks MRI and CT utilization by office-based physicians. Levin described a huge differential: “Looking at MRIs performed by nonradiologists in their own offices, the number of scans increase 385% from 2000 to 2009. This compares with just a 73% increase in scans performed by radiologists in private offices.” He went on to describe a similar disparity in the number of CT scans performed: While office-based radiologists saw a 113% increase in that period, nonradiologist scans went up 506%. Taking up the banner for the opposition, Michael Hutchinson, MD, an associate professor at New York University (NYU) and a neurologist at NYU’s Langone Medical Center, published “Self-Referral of Imaging Does Not Imply Overutilization” in the January 2009 issue of the Journal of Neuroimaging. Hutchinson and six colleagues offered alternative interpretations of the data in their report and supported their conclusions with a poll study of their own. Hutchinson and his collaborators downplayed the imaging self-referral crisis as something of a tempest in a teapot because, according to Health and Human Services’ own data, MRI (the focus of the neurologists’ concerns) “absorbs only three-quarters of 1% of all U.S. healthcare spending, about the same as in 1990.” Hutchinson and his colleagues contended that overall increases in advanced imaging have been the natural result of improvements in the technology and its consequent proliferation. Hutchinson sharply criticized how physician-ownership opponents calculate self-referral’s impact on utilization. He said oft-cited studies that supposedly prove overutilization are barely relevant to today’s advanced imaging debate. For example, a Journal of the American Medical Association article by Hillman et al (“Responses to a Payment Policy Denying Professional Charges for Diagnostic Imaging by Nonradiologist Physicians”) is more than 15 years old and focused on plain film x-rays in physician offices. Critics of self-referral commonly use this study to support accusations that physicians with in-office services perform scans at a rate four to eight times greater than doctors who refer out. Further, he pointed out that much-buzzed articles by G. S. Gazelle et al (“Utilization of Diagnostic Medical Imaging: Comparison of Radiologist Referral Versus Same-Specialty Referral”) and Danny R. Hughes et al (“Imaging Self-Referral Associated With Higher Costs and Limited Impact on Duration of Illness”) ignore hospital imaging when estimating utilization rates. “It’s still ‘standard of care’ for physicians to send patients to the hospital for scans,” said Hutchinson, “and if you don’t include these in your data, utilization comparisons will be skewed.” In other words, it will make the self-referrers’ numbers seem higher by comparison. Others without a vested interest in the outcome of self-referrals should be more likely to look objectively at the data. Healthcare “think tanks,” such as the Washington-based Center for Studying Health System Change (HSC), have been tracking the self-referral debate, too. In its December 2010 Data Bulletin, the HSC presented findings from its 2008 Health Tracking Physician Survey, a nationally representative mail survey with responses from roughly 4,700 U.S. physicians in full-time private practice, (excluding radiology, pathology, and anesthesiology). To examine the extent of physician practice ownership or leasing of medical equipment, the sample was limited to 2,750 physicians practicing in community-based, physician-owned practices. Overall, 17.4% of physicians in the survey reported ownership or leasing interest in advanced scanning services, with surgical specialties leading the pack at 30.3%. Group size also had an impact: Only 6.7% of one- and two-doctor practices reported interests in advanced imaging, but groups with more than 50 physicians topped 52.9%. In its conclusions, the HSC commented about health policy implications: “Given the growing evidence that physician self-referral contributes to unnecessary and costly care, policy makers might reconsider the broadness of the in-office ancillary service exemption to the Stark law.” The data findings in the HSC’s survey only track ownership; to comment on utilization, its authors relied on evidence presented in other studies (such as the Hughes article previously mentioned). The HSC’s public affairs director (and report contributor) Alwyn Cassil noted that utilization calculations for self-referrers varied somewhat, but in the end, every study showed some increase in utilization rates for doctors who provided imaging services in-house. Even staunch defenders of self-referral concede that point. • More thorough studies that take into account more than simple procedure counts, including overall patient volumes (utilization rates calculated per patient rather than per physician) and diagnosis and acuity (utilization rates comparing patients with similar medical conditions and indications). • More accurate and thorough tracking of imaging’s impact on healthcare costs, including technology and standard-of-care impact—for example, if CT has all but replaced angiography, the increased CT utilization should show some offset by the decrease in angiograms. Lacking such evidence, the debates threaten to continue to look like turf battles between specialties that have come into direct competition for controlling big-ticket imaging modalities. — Timothy W. Boden, CMPE, is a freelance writer and healthcare consultant based in Starkville, Miss.